"Muppets Most Wanted" opens with a self-referential song that comments on the fact that sequels are never quite as good as the film that inspired them and then goes on to prove the point. When everyone's favorite frog, bear, pig, and whatever Gonzo is returned in 2011 for "The Muppets," the result was a surprising creative success. And just as the pond-hopping "The Great Muppet Caper" followed on the heels of "The Muppet Movie" over thirty years ago, it makes a certain degree of sense that this generation's Muppet sequel would also be a crime-laced adventure for the wisecracking vaudevillian puppets. However, the creative team behind this follow-up have misplaced and mis-prioritized so much of what worked about "The Muppets" that it's hard to believe sometimes that it's not an entirely different crew. "Muppets Most Wanted" has the smell of straight-to-DVD sequel from top to bottom; something that only superficially resembles what came before. The most significant and bizarre problem with "Muppets Most Wanted" is a lack of a protagonist. That might sound silly for a film cast largely with puppets but "The Muppets" gave us multiple characters to follow, including not just the introduction of the charming Walter but the return of Kermit alongside engaging characters played by Jason Segel and Amy Adams. In a baffling screenwriting move, Bobin and Nicholas Stoller not only separate Kermit from his friends for most of the film's running time but don't fill in that gap with another lead to follow. It is a story without an anchor, a film that bounces back and forth between its sometimes entertaining subplots but without a hint of thematic density. Yes, I know it's "just" a lighthearted family diversion but the reasons "The Muppet Movie" and "The Muppets" resonated was because they touched on issues that were identifiable to both kids and adults—we all knew what Kermit meant when he said it wasn't easy being green or had our own rainbow connection to find. "Muppets Most Wanted" touches on little more than silly accents. Now that "The Muppet Show" is back on the international radar in the world of these films, Dominic Badguy (a winning Ricky Gervais) swoops in to encourage Kermit, Fozzie, Gonzo, and the rest of the gang to go on a world tour. Of course, with a name like Badguy, their new manager has a dastardly plan up his sleeve. On their first stop in Germany, Kermit is kidnapped and shuttled off to a Russian gulag, where he is meant to take the place of an international criminal "bad frog" named Constantine, who just happens to look exactly like Kermie, just with one of the cinematically historic signs of evil—a facial mole. 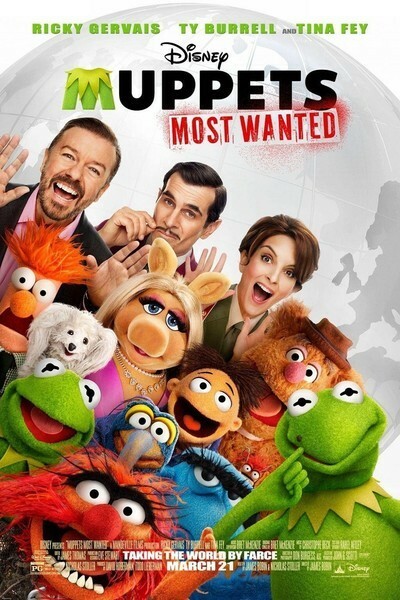 While poor Kermit is trying to convince his guard Nadya (Tina Fey) that he's a framed frog and keep on the good side of fellow inmates played by, among others, Ray Liotta, Danny Trejo, and Jemaine Clement, Constantine is working with Dominic on their endgame, stealing The Crown Jewels while using The Muppets tour as a cover. Essentially just to get the gang to a number of fun locales (and allow for endless stream of cameos from the likes of Salma Hayek, Christoph Waltz, Chloe Grace Moretz, Saoirse Ronan, and dozens more), the items needed to lift the jewels are spread out around Europe. As more of the Muppets start to wonder at Constantine/Kermit's odd behavior, Sam Eagle and an Interpol agent named Jean Pierre Napoleon (an inspired Ty Burrell) track the crimes being left in their wake. In the screenwriters' most egregious error, we spend more time with Constantine than any of the classic Muppets, and I longed for someone to root for other than Kermit in a Siberian prison. It would have been so much smarter to have Walter, a solid new hero from the last film, figure out the deception immediately and then work to unveil it for everyone else. There are undeniably inspired bits in "Muppets Most Wanted"—one is tempted to recommend it just to see Ray Liotta performing a number from "A Chorus Line" in a Russian gulag, and Burrell's running gag about the differences between European crime solvers and his American counterpart gets laughs—but the comedic tone is inarguably more frantic and haphazard than arguably ever before in this series. Even the songs, again composed by "Flight of the Conchords" vet Bret McKenzie, have the tone of afterthought; B-sides to ideas explored in the previous film. The music gets notably stronger as the film goes on but the first few numbers had me longing for something as catchy and clever as "Life's a Happy Song". The best Muppet movies have been so closely associated with their music over the years and no one is going to be humming a single bar of a "Muppets Most Wanted" track on the way to the parking garage. While it doesn't help that "Muppets Most Wanted" is an unacceptable 112 minutes long, I must admit that it's never gratingly bad. It's not as creatively bankrupt as the worst family films as the creators still have that anything-for-a-laugh aesthetic that demands you only wait a few seconds between jokes. At its best, it captures the show's often-manic pace, shuffling one bit off the stage as the next one starts up. There are laughs here and there but The Muppets haven't been one of our most enduring franchises thanks to films that can be labeled little more than sporadically entertaining.